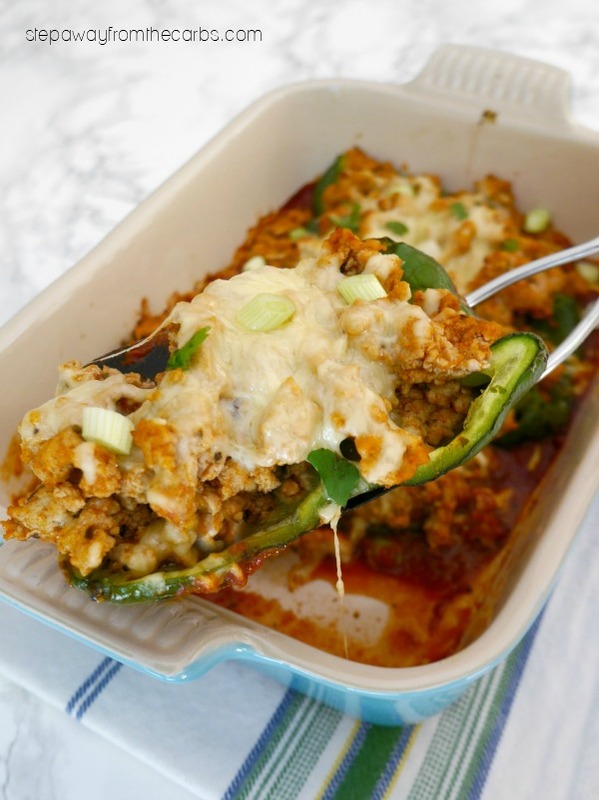 These turkey enchilada stuffed poblanos are a fantastic Mexican-inspired meal. 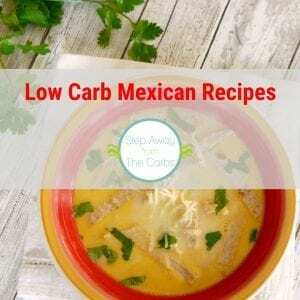 Low carb and gluten free recipe. This dish is a seriously awesome combination of flavors. 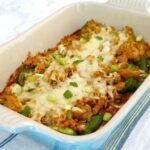 The turkey enchilada filling works perfectly with the slight heat from the poblanos, and then the sauce and cheese just make the meal complete. Carb count for this meal is 10g net per serving – but it is SUPER filling and you won’t even need a salad on the side! Alternatively you could also serve it as an appetizer for four people – but it would still be a pretty good serving! 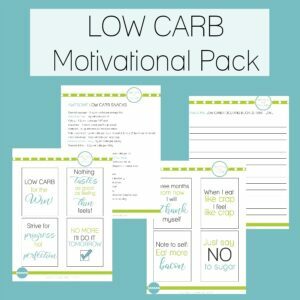 There are several components to this meal – but don’t let the long ingredient or instruction list put you off! The result is so delicious, it’s definitely worth it! Prepare the poblanos by cutting them in half lengthwise and removing the seeds and core. 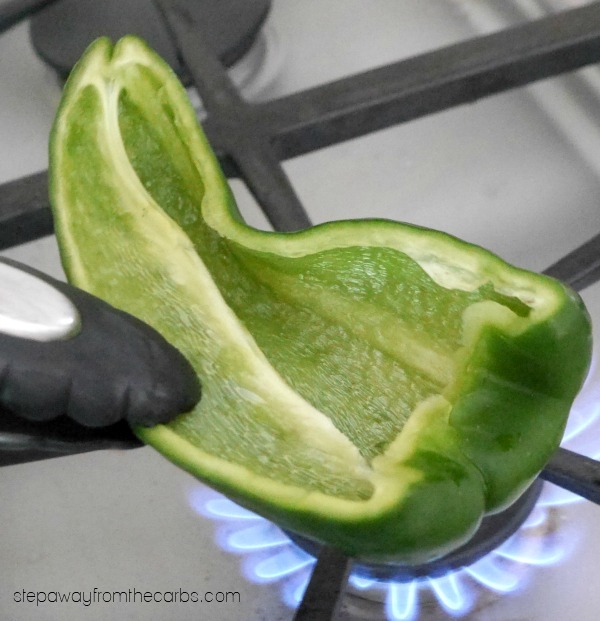 Use tongs to roast the skin of the poblanos over an open flame, turning the peppers until the skin is blistered all over. Once blistered, place each poblano in a plastic bag, and let steam for 15 minutes. Meanwhile, prepare the enchilada sauce. 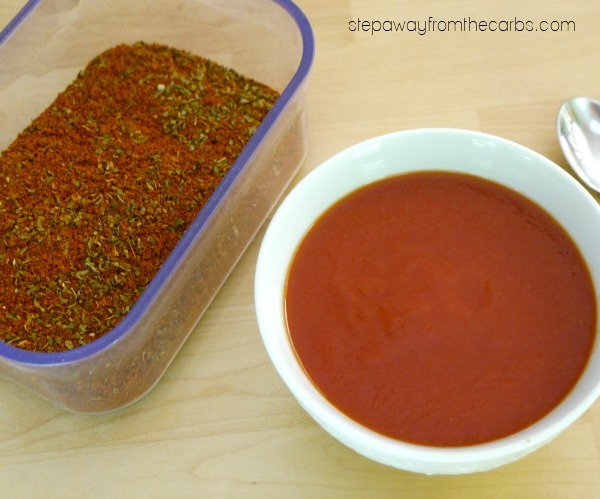 I use my Mexican Dry Rub for this – and as you can see I use it so often I make a big batch at a time! It’s basically a combination of ground cumin, paprika, and dried oregano. Stir it into canned tomato sauce and set aside. For the turkey, add some olive oil to a large skillet over a medium heat. 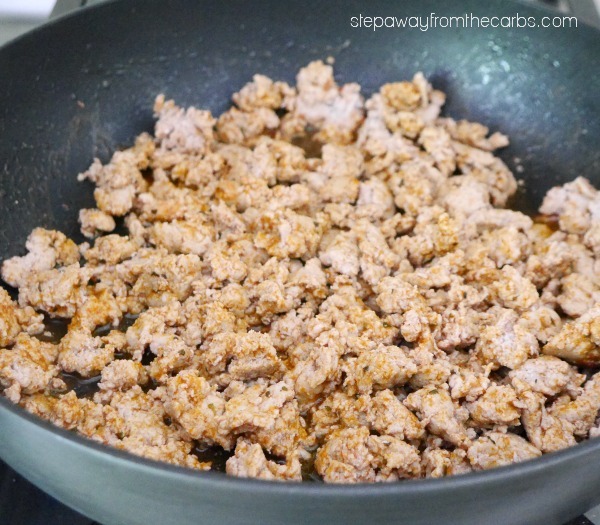 Add ground turkey, onion powder, and garlic paste. When the meat has browned, add two tablespoons of the sauce, together with salt and pepper. Pour the remaining sauce into the base of a baking dish. 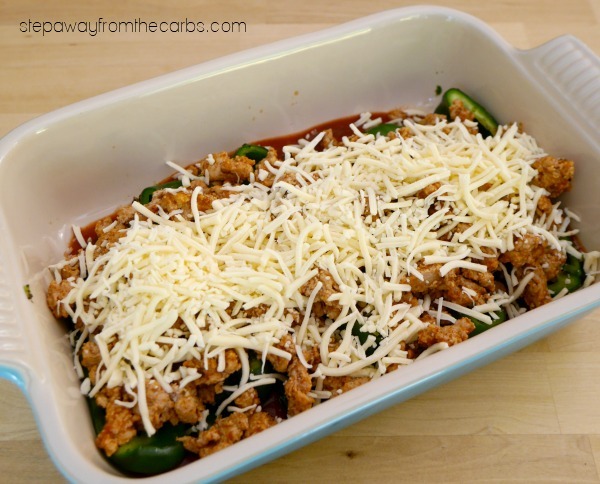 Use a dinner knife or similar to scrape off the charred skin of the peppers, then place the peppers in the baking dish. Divide the turkey mixture over the top of the poblanos, then sprinkle some shredded cheese over the top (I used chihuahua, but any Mexican blend would work well). Cover the dish with foil and roast in a preheated oven for 20 minutes. Remove the cover and continue to roast for another 5-7 minutes or until the cheese starts to brown. Garnish with a chopped green onion and fresh cilantro leaves, then serve. Meanwhile, prepare the enchilada sauce by mixing all ingredients together. Set aside. For the turkey filling, add the olive oil to a large skillet over a medium heat. Add ground turkey, onion powder, and garlic paste. When the meat has browned, add two tablespoons of the sauce, together with salt and pepper. Pour the remaining sauce into the base of a baking dish. 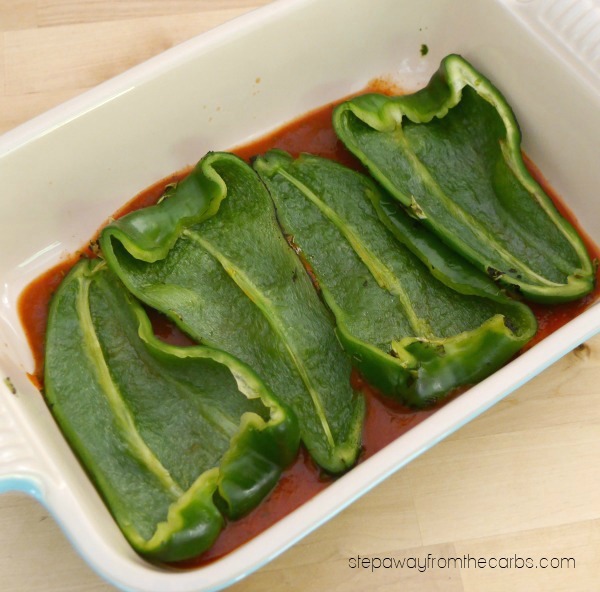 Use a dinner knife or similar to scrape off the charred skin of the peppers, then place the peppers in the baking dish. 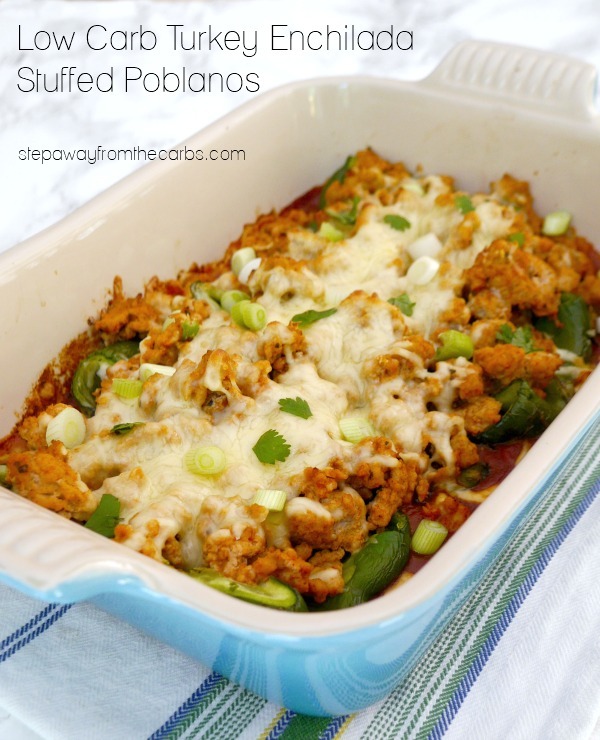 Divide the turkey mixture over the top of the poblanos, then sprinkle some shredded cheese over the top. Cover the dish and roast for 20 minutes. Remove the cover and continue to roast for another 5-7 minutes or until the cheese starts to brown. Garnish with chopped green onions and fresh cilantro leaves, then serve.